individuals who distinguish themselves by acts of heroism involving combat with enemy forces. The Croix de Guerre (English translation: Cross of War) is a military decoration of France. 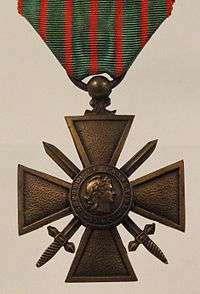 It was first created in 1915 and consists of a square-cross medal on two crossed swords, hanging from a ribbon with various degree pins. The decoration was awarded during World War I, again in World War II, and in other conflicts. The Croix de guerre was also commonly bestowed on foreign military forces allied to France. Regarding the United States in WWI, on April 10, 12, and 13, 1918, the lines being held by the troops of the 102nd Infantry Regiment, of the 26th "Yankee" Division, in Bois Brûlé, near Apremont in the Ardennes, were heavily bombarded and attacked by the Germans. At first the Germans secured a foothold in some advanced trenches which were not strongly held but, thereafter, sturdy counterattacks by the 102nd Infantry - at the point of the bayonet - succeeded in driving the enemy out with serious losses, entirely re-establishing the American line. For its gallantry the 102nd Infantry was cited in a general order of the French 32nd Army Corps on April 26, 1918. In an impressive ceremony occurring in a field near Boucq on April 28, 1918, the 102nd Infantry's regimental flag was decorated with the Croix de Guerre by French General Fenelon F.G. Passaga. “I am proud to decorate the flag of a regiment which has shown such fortitude and courage,” he said. “I am proud to decorate the flag of a nation which has come to aid in the fight for liberty.” Thus, the 102nd Infantry became the very first American unit to be honored by a foreign country for exceptional bravery in combat. In addition, 117 members of the 102nd Infantry received the award, including its commander, Colonel George H. Shelton. 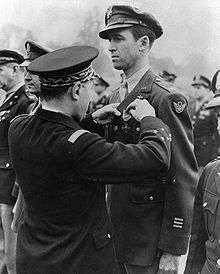 In World War II, the 320th Bombardment Group received the Croix de Guerre avec Palme for action in preparation for and in support of Allied offensive operations in central Italy, April–June 1944. It was the first American unit in this war to be awarded the citation. Members of the 440th AAA AW Battalion (Anti-Aircraft Artillery - Automatic Weapons) of the U.S. Army also received the Croix de Guerre avec Palme (unit award) for stopping the German Ardennes counter-offensive in holding the town of Gouvy, Belgium for 4 1⁄2 days at the beginning of the Battle of the Bulge on December 16, 1944. Gouvy is midway between St. Vith and Bastogne. Commanding Officer of the 440th, Lt. Col. Robert O. Stone, and Pfc. Joseph P. Regis, also received an individual award of the Croix de Guerre avec Palme. On June 21, 1945, French General De Gaulle presented the following citation to the 34th United States Infantry Division: "A 'division d’elite', whose loyal and efficient cooperation with French divisions, begun in TUNISIA, was gloriously continued throughout the Italian campaign, in particular during the operations of BELVEDERE when the 34th Division, despite the difficulties of the moment, displayed most courageous efforts in support of the operations of the 3rd Algerian Division. This citation bears with it the award of Croix de Guerre with Palm." Soldiers of the US Army 509th Parachute Infantry Regiment "Geronimos" were awarded the Croix de Guerre with Silver Star, For Service in the Southern France campaign. The 509th Unit colors bear the Streamer embroidered "MUY EN PROVENCE". 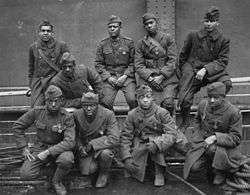 Needham Roberts served with the 369th Infantry Division, better known as the Harlem Hellfighters or the Black Rattlers, a regiment consisted entirely of African Americans excepting their commanding officers. Henry Johnson was the first American alongside Henry Johnson to receive the Croix de Guerre. Milunka Savić, was awarded the French Croix de Guerre 1914–1918 with Palm. She is the only woman in the world awarded with this medal for service in World War I.
James Waddell was one of New Zealand’s most highly decorated soldiers of the First World War. Waddell was received in the French Legion of Honour and promoted twice. He was also awarded the French Croix de Guerre seven times during the war. George Albert Robert Yull, served with the RACS and won the Croix de Guerre which was given to him by Charles de Gaulle on the day when Paris was liberated. Jehan Alain French Organist and composer. Engaged with enemy, single-handedly killing 16 with carbine before being killed himself. Phil H. Bucklew, US naval officer; "Father of American Naval Special Warfare". Frantz Fanon, awarded the French Croix de Guerre by Raoul Salan for service in the French Free Forces in North Africa and Alsace. General Dragoljub Mihailovic, Serbian Chetnik leader, awarded by Charles de Gaulle. Frank Perconte, member of Easy Company, 506th Parachute Infantry Regiment. ↑ At the time of the Algerian War, Algeria was considered part of France and war actions labelled "law enforcement operations", so soldiers were awarded the Croix de la Valeur Militaire instead of the Croix de guerre des TOE. ↑ Brief History of the 26th Division in Pictures, published by the "Committee of Welcome" appointed by the Governor of Massachusetts, Hon. Calvin Coolidge, and the Mayor of Boston, Hon. Andrew J. Peters, Official Welcome Home Programme, April 25, 1919. Also, the Massachusetts State House mural “Decoration of the Colors of the 102nd United States Infantry,” painted in 1927 by Richard Andrew. Also, the memorial honoring the 102nd Infantry Regiment, 26th Division, A.E.F., in Westfield, MA. ↑ Tannehill, Victor C. (1978). Boomerang, the story of the 320th Bomb Group. Racine, Wisconsin. ISBN 0-9605900-0-5. LCCN 79-105410. ↑ "The United States Army - 4/25 ABCT". ↑ Blackmore, Kate, 'Armstrong, Millicent Sylvia (1888–1973)', Australian Dictionary of Biography, National Centre of Biography, Australian National University, , accessed 1 May 2012. ↑ "French Croix de Guerre Recipients from WWI-Surnames L thru R - 32D 'Red Arrow' Veteran Association". www.32nd-division.org. Retrieved 2016-11-16. ↑ "Whitfield Jack (Class of 1928)". West Point, New York: United States Military Academy. October 30, 1989. Retrieved March 25, 2015. ↑ National Pigeon Day. "History of Cher Ami". Retrieved 2011-03-31. ↑ Karamanoukian, Hasmik; Kazanchian, Garbis (1998). Զօրավար Արամ Գարամանուկեանի կեանքն ու գործը (in Armenian). Mayreni Publishing.